Discourse ships with a couple of categories and topics, but they usually are in English. No matter what language your forum is using. That is going to change. Up until now configuring DISCOURSE_DEFAULT_LOCALE in app.yml was the only way to change that. And you had to do it before bootstrapping the container. Changing the default language in the wizard will automatically translate all seeded categories and topics as long as you didn’t already edit them manually. 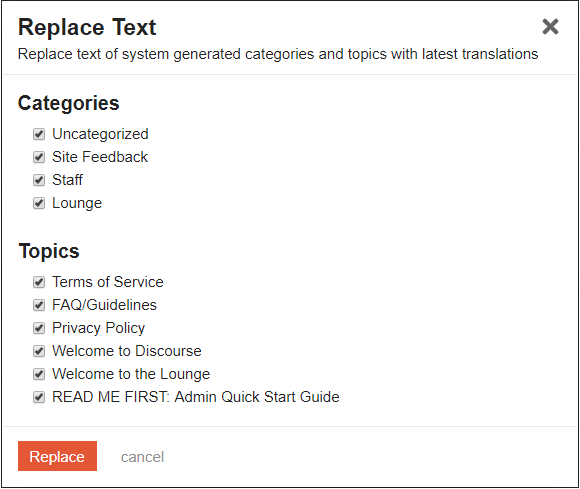 You can find a new “Replace Text…” button in the “Admin > Customize > Text Content” section (/admin/customize/site_texts). Clicking on it brings up a dialog where you can select the content you’d like to update. The dialog shows you only the categories and topics it could find. Some might be missing if you manually deleted any of them or when your forum was created a long time ago, because we didn’t keep track of “Welcome topics” in the past. Clicking “Replace” will update the selected content with the latest translations for the current default locale. It will create new revisions for updated posts, so you will be able to see the diff and revert changes in the post’s revision history. It updates all seeded categories and topics without checking if you manually edited them or not. So be careful! There are currently no translations for the “Admin Quick Start Guide”, but I’m planning to make it translatable in the near future. Stay tuned. I’ve been translating, reviewing and proofreading everything from scratch on Transifex for the last couple of weeks now, and if this is also there, it’d be perfect. No, assets aren’t localized. Transifex doesn’t support that. But the seeded topics use only one image with English text in it. I guess we can live with that for know. If you haven't already, launch the [setup wizard](/wizard) and go through the steps to configure your site. You can run the wizard as many times as you want, it's completely safe! You can also access it via the "hamburger" <kbd>☰</kbd> menu in the upper right: Admin functions are generally marked with the wrench :wrench:  icon, so look for that. 1. **Admins**, who can do anything and configure anything on this site. 2. **Moderators**, who can edit all posts and users, but cannot add categories or change any site settings. Oh by assets did you mean the text of the translations? I think @gerhard assumed you meant images. Yes, by “assets” I mean the actual text. Sorry about that. I did a bit of research and found them on Transifex. Those specific docs will be huuuge to translate. God help me. As for the actual assets, yes, I guess we can live with that forever haha. There’s no need to localize them. Like, ever. This text is somewhat confusing to me, @codinghorror can you think of something better? Maybe Reset Seeded Translations.../ Reset Translations... ? Interestingly if we go with Reset Translations... we can use the same dialog to reset overrides in bulk. I think there is a lot of value in a “reset all translations”, though I guess technically it would be “reset all text”? We could possibly give up this button altogether and only trigger the UI when you switch “default locale” on the site. So if you HAD to reseed you could flick to french, ignore … flick to english? I think “reset all customized text” is still a good idea. Assuming that these documents will continue to evolve in places would ‘refresh’ be a better word? They aren’t necessarily going to revert, right? They aren’t necessarily going to revert, right? I think they are going to revert, but need @gerhard to confirm, I think it takes whatever text is in the various topics and overwrites with what we have in core. It would remove all the changes you made to the TOS and so on. I get what’s happening, but my point is that if I build a site in 2014 and customise the ToS, and in the five years which follow the model ToS in core updated, then that button isn’t reverting it to the original ToS I had, it’s replacing it with a model document which is five years newer. It’s being replaced, maybe refreshed, but not reset. Yes it is … one thing we should confirm here is that the replacement is done as an edit, at least that way you have a chance of recovering the diff. I thought about doing that, but I didn’t want to add a special case in the site settings code just for default_locale and triggering the reseed manually without changing the locale can be useful in other situations as well. For example: Replacing topics with new text shipped in core like we did with the ToS a few months ago. And the wizard automatically reseeds everything when the language is changed. I like “replace” and “refresh”… I knew “reseed” was too technical and probably isn’t even a real word, but I couldn’t think of something better. one thing we should confirm here is that the replacement is done as an edit, at least that way you have a chance of recovering the diff. Yes, it’s creating a new revision.